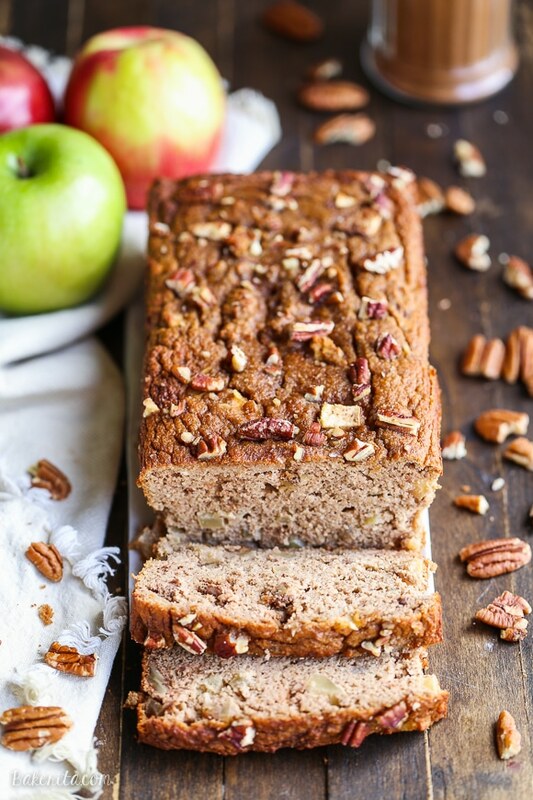 This Paleo Apple Cinnamon Bread is a healthy breakfast or snack that’s made with applesauce! This gluten-free and grain-free spiced loaf is so easy and moist. Hello from Costa Rica!! When this post goes out, I’ll probably be laying in the sun, basking in the 90 degree heat (not to brag or anything). As I write this though, I’m waiting for my delayed flight to Houston, where I’ll then connect to Liberia, Costa Rica. In the meantime, I’ll distract myself from the wait by talking to you about this week’s baking expeditions! 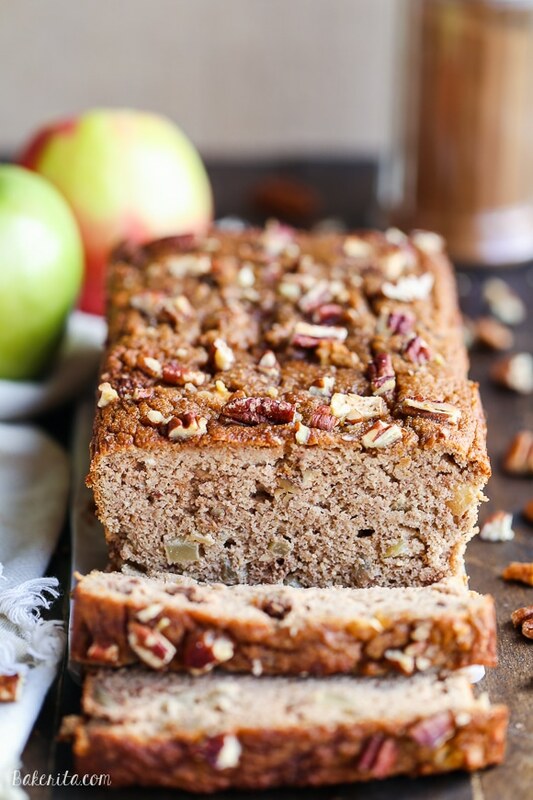 Namely, this apple cinnamon bread. This recipe was one I expected to work on the first try, and that was sooo not the case. I tested and tweaked and finally, we have a winner! This bread is full of apple flavor. 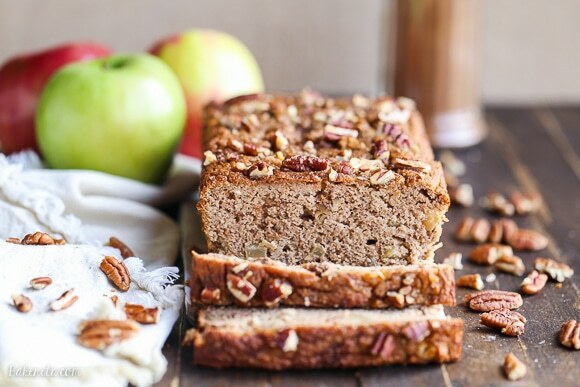 It’s not just that the apple chunks help flavor the bread – the base is made with applesauce, so that sweet + fresh apple flavor permeates every bite of it. The applesauce also helps keep the bread super moist and tender. Because it has natural sweetness, you barely have to use any additional sweetness – just a 1/4 cup of coconut sugar does the trick. In one iteration of this bread, I left the sugar out entirely and it wasn’t bad at all. I preferred it with a little extra sweetness but if you have less of a sweet tooth, you could try playing with the amount. Coconut flour is what holds this bread together. Unfortunately, you can’t substitute anything else. Coconut flour is it’s own animal – it’s much more absorbent than any other flours and isn’t easily substituted. Thankfully, it’s not too expensive and a little bit goes a long way. A bag will last you a heck of a long time, and there’s a bunch of delicious recipes on my site and around the web for you to use it in. 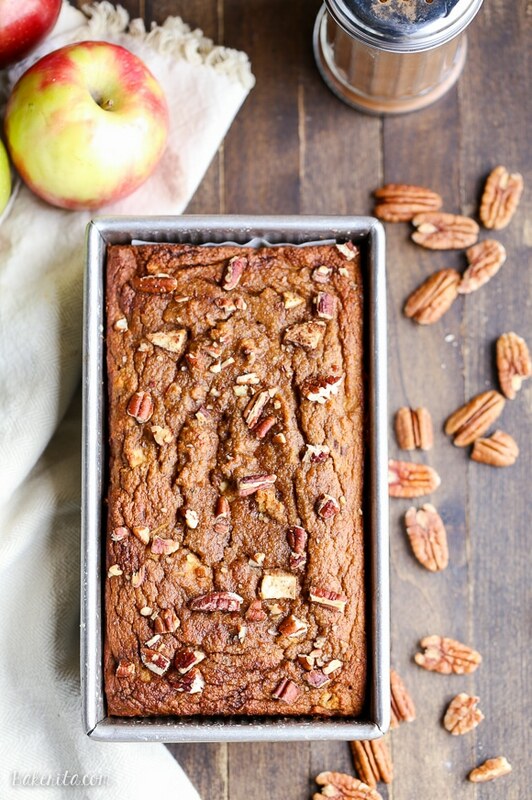 I added toasted pecans to this apple cinnamon bread too. I love some crunch in my baked goods and I loved the toasty, rich flavor they brought here. Of course, those of you cringing at my addition of nuts can definitely leave them out. Alternatively, use your fave nut in place of the pecans (walnuts would be good). This wouldn’t be apple cinnamon bread without a healthy dose of cinnamon, and some nutmeg and allspice round out the spice party. 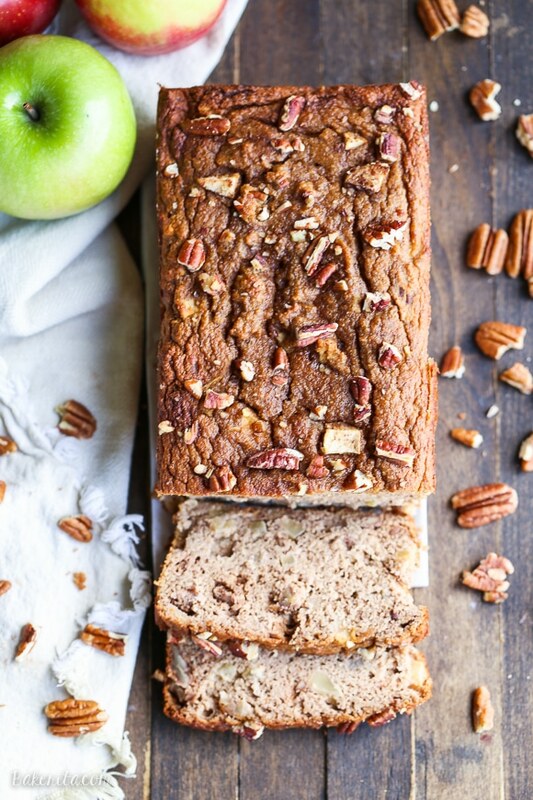 This apple cinnamon bread is delicious warm, but the flavors of the bread come together and get more prevalent a day after the loaf is baked, so make sure it lasts that long :) it’s awesome on it’s own, and even better with a little slather of almond butter. Enjoy! Grease a 9"x5" loaf pan and preheat the oven to 350ºF. In a large bowl or mixer, combine the applesauce, eggs, coconut oil, coconut sugar, vanilla extract and nut butter until fully combined. Add the coconut flour, cinnamon, baking soda, baking powder, and sea salt to the wet ingredients and mix well. Fold in the apple chunks and pecans. Bake in the preheated oven for about 50-60 minutes. A toothpick inserted into the center should come out clean, and the top should spring back slightly when pressed. If you touch the top and it feels wet or sinks down at all, it’s not done yet! Remove from oven and allow to cool on a wire rack for about ½ hour. Flip out onto a cooling rack to finish cooling completely. Store leftovers in an airtight container the refrigerator for up to a week or in the freezer for up to 3 months. I hope you’re having so much fun in Costa Rica, Rachel! I’m with you in spirit! :) This bread looks amazing! I wish I could reach right through my screen and grab a piece! Oh my gosh this look so yummy! Oh boy I love cinnamon bread! And yes, I have a sweet tooth so I will add a bit more sugar when I make it. This is a really great recipe, thank you for sharing! Yummy! Apple and cinnamon is a fantastic combination. You can totally brag. But that’s only because I’ll be on a flight to 85-degree FL soon! This bread is awesome!! Looks so perfect with the happy texture! Love all that apple flavor from the chunks and applesauce! And I love the pecans :) Delicious- pinning! I hope you’re having the best trip! Costa Rica sounds dreamy right about now. And so does this apple cinnamon bread! You are the paleo baking queen my friend! Well I’m totally jealous you are in Costa Rica!! Please soak up some sun for me!! Guess I will have to stay home and eat my jealous feelings with this apple cinnamon bread! Which isn’t a bad idea, since this bread looks delicious! LOVE that it is packed with tons of apple flavor! Amazing, girlfriend! Cheers and have a fabulous vacay! Have soooo much fun in Costa Rica!!! I’ll have to just pretend I’m on the beach here at home :) And this bread sounds amazing! Love apple goodies! So jealous that your in Costa Rica! Have fun & this bread looks SO delicious. Is it possible to swop the coconut sugar for xylitol sugar? I haven’t tried it, but it should work out just fine, especially since it’s such a small amount. Hope you enjoy the recipe, Bronwen! Going to give this a shot. If I do not have coconut sugar would 1:1 honey be suitable? If not, what would be a good ratio? Hi Chris – this bread is pretty moist, and I’m not sure honey would be the best choice because it could make the batter too liquidy. I would stick to a granulated sweetener if possible. It’s likely too delicate and moist for a pop-up toaster, but it could probably be lightly toasted in a toaster oven! Omg this bread was AMAZING! I could not stop eating it its dangerously good THANK YOU ! So glad you’re enjoying it, Isabella! Tried this out and it was super delicious! Out of curiosity how long is this good for? I tried it on the third day and it tasted really bitter all of a sudden…. somewhat like alcohol so I’m not sure what could have spoiled. Glad you enjoyed it MG, but sorry it went off so quickly! Were you keeping it in the fridge? That’s definitely important to keeping this bread good for longer…it’s so moist that it can go bad quickly at room temperature. You can also slice it and freeze it, and then defrost slices in the microwave as you want them to keep it good for even longer. Hope this helps! Thanks for responding! I just had it at room temperature so I’ll be sure to keep it in the fridge next time. Awesome, that should definitely help it keep for longer. Enjoy! Anyone tried making muffins with this recipe? Would any adjustments need to be made if you made muffins instead? How much time do you think muffins would take to cook? I haven’t done them as muffins but I’d bake them around 18-22 minutes, or until they spring back when you touch them with your finger. Enjoy! I don’t see the nutritional information, specifically calorie count? Hi Linda, the recipe is now updated with nutritional info. Enjoy! ..I can’t seem to see how much coconut flour I should use? The recipe calls for 1/2 cup + 2 tablespoons of coconut flour. I found this recipe in a google search because I had apples and coconut flour to use up before their expiration date. It seemed like there would be far too much moisture in the recipe, so I upped the coconut flour by about two tablespoons, and left out an entire egg. Instead of Almond butter, I used PB2 that I rehydrated with a little water. I also baked it for about 1 hour 20 minutes at 375 (I keep a thermometer in my oven for verifying temperature). The bread turned out well, although still considerably more moist then I’d like. I’d prefer my quick breads to have more structure – difficult with a paleo recipe, I guess. Thanks for the recipe! Hi Jamie, sorry you had trouble! The fats in the nut butter definitely help provide some structure, so using the PB2 + water could have caused some excess moisture as well. Hope you’re still able to enjoy it! It doesn’t seem like you should rate her recipe poorly based on your alterations. You aren’t really rating her recipe. OMG! I made this this evening after I had also made some orange and cranberry muffins. The bread is so moist and to die for. I wouldn’t really call it a bread…delicious….so glad that I came upon this recipe. I will definitely be making it again. I used sunflower butter. So thrilled to hear you’re loving it Kathy! Thanks for the feedback. Where do you add the sugar tho? Assuming with the dry ingredients before it’s combined with the wet, but it’s not stated. So I made it without sugar. So sorry about that Nicco! The recipe has been updated to reflect where the coconut sugar is added. Can I make this Apple Loaf with chia eggs?There are 4 eggs in this recipe, so that’s a lot of eggs….I’m afraid to substitute that many eggs. Suggestions? Hi Ally…it would probably make it too wet. I’m actually actively working on this problem, so I’m hoping to have a vegan version of this soon-ish. If you were to try to substitute, you’d probably want to add a little extra coconut flour and leavener too. What a great recipe. The texture is great. I didn’t want to use coconut sugar so just replaced it with the same amount of additional coconut flour. Didn’t know what would happen but am really happy with how it turned out. Oh, and I used walnuts instead of pecans.